You just got a nice adorable crib for your baby. Good job! But the process doesn’t end there. The next thing you need to have is the crib bedding. With hundreds of choices in the market today, from economy to luxury and ultra-trendy, there’s no doubt that you will find the best quality bedding set that will not only spruce up your baby’s nursery room but will also give him or her maximum comfort for the weeks and months to come. To kick off your search, check out these best nursery crib beddings that moms from various parts of the country are buying. Hopefully, you may find the one you’re looking for in just a few clicks! This cute comfy crib bedding set is all about the bows, featuring mini prints of bows and hearts in different lovely colors: white, bright pink, light pink and aqua. The set includes a comforter, a crib sheet, dust ruffle, and a Minnie Mouse-shaped wall art. This adorable woodland-theme bedding set includes a fitted sheet, dust ruffle and a quilt featuring cute familiar animals on a green ground. The GEENNY Bedding Set has so much to offer – 13 pieces to be exact. These include a comforter, bumper, fitted sheet, skirt, one diaper stacker, two window valances, two throw pillows, a toy bag, and three wall art decors. The fabrics are made from cotton polyester. Made from cotton and polyester materials, this cute Baby Boy Sport Crib Bedding Set features hand sew-on patterns of a baseball bat, glove, and a soccer ball. The crib sheet is fully elasticized for a snug fit. The Bacati Noah Tribal Crib Set features 100% cotton percale fabrics with polyester filling in the comforter, toys and the bumper pad. It comes with other crib essentials and accessories like a fitted sheet, crib skirt, and a 3-piece wall hang. This 7-piece Lion Safari Baby Crib Set includes a fitted sheet, 4 bumper pads, a dust ruffle, and a quilt. It features an adorable hand sew-on that can be used as a tummy mat when baby plays on the floor. This five-piece set includes two fitted crib sheets, one comforter, dust ruffle, and wire wall art. Perfect for both baby girls and boys, the Little Love by NoJo fashionable comforter set features geometric arrow patterns and owls with appliqued feathers and wings in different colors. 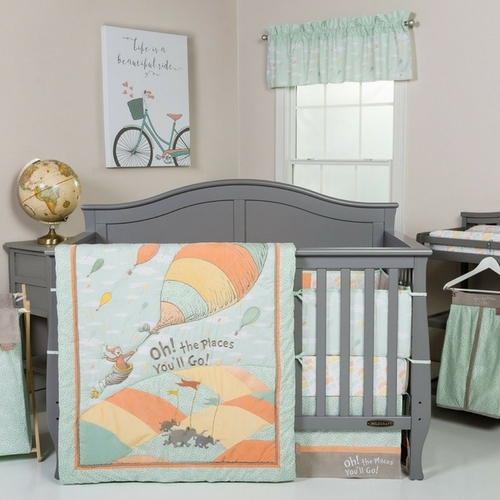 This crib bedding set features neutral colors and designs to match both genders. The Trend Lab Dr. Seuss Crib Set includes a quilt, crib skirt and sheet, changing pad cover, and a diaper stacker – of which fabrics are made from 100% cotton. Featuring a hand-painted floral print in solid blush pink fabrics, the Sweet Jojo Crib Set will surely add beauty and class to your little girl’s nursery room. It comes with 9 pieces, including a comfortable crib blanket, fitted crib sheet, valances, a diaper stacker, and a toy bag. Crib bedding sets are a must-have in every nursery room. They don’t only secure the comfort of your baby, they also add a tone and style to your baby’s little sanctuary. But whatever theme or design you want, there are several important considerations you need to make. Check out these guidelines in choosing the best nursery crib bedding set. Crib bedding sets are available so you don’t only have a coherent design, you also do away from the stress of having to buy each piece separately. Some nursery crib sets come with a few to a dozen pieces. Regardless of what you’re buying, the crib set should include the following essentials: a fitted crib sheet, a mattress pad, crib skirt, blanket and swaddle, comforter, quilt, and pillow. If the set you’re eyeing doesn’t most of these, better check out something else. You will want to buy the bedding set which fits perfectly in your crib. The standard dimensions of mini mattresses are 24 x 38 inches while standard mattresses measure 27 x 52 inches. Your baby will be spending more time in her bed so you want to make sure it’s giving her lasting comfort. Make sure it is very soft and gentle to your baby’s skin. A majority of crib beddings are made from 100% cotton or a blend of cotton and polyester, which are both preferable for babies. Flannel cotton sheets are ideal for babies born in winter because they retain heat, while cotton blends are great during summer season because they have better air circulation. Many parents choose bedding sets that are made from organic or chemical-free fabrics. If your baby has sensitive skin and prone to rashes, you may want to opt for this kind of nursery bedding set. Also, check if the pieces are machine-washable. If you can simply toss everything in your washing machine, life will be less stressful for you.